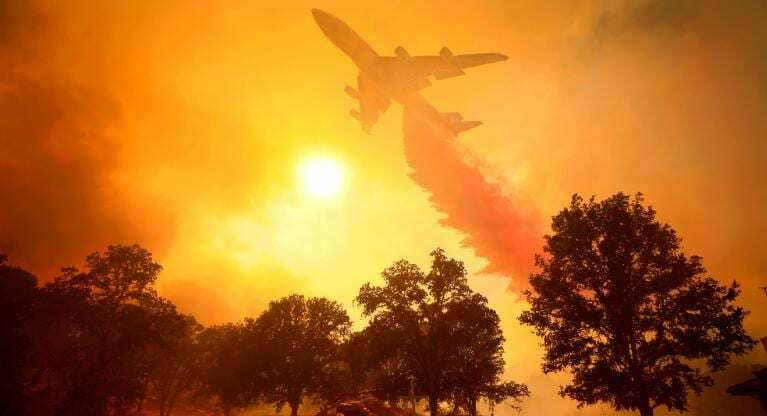 About 14,000 firefighters battled relentless flames ripping across California on Tuesday (Aug 8), as the death toll from a series of infernos that erupted last month hit 11. The Mendocino Complex fire which is made up of two major blazes in the state’s north has now ravaged almost 118,000 hectares – approximately the size of Los Angeles in a time span of less than two weeks. This is California’s biggest wildfire on record and it is expected to burn for the rest of the month. So far the firefighters have reported that they have barely started to control a third of fires. More reinforcements are needed and are coming in at a steady pace. Transporting tankers of water is also causing a logistical problems and reserves are getting low. Firefighters are currently tackling 18 major blazes across the state amid strong winds and low humidity are driving the blaze in all directions. Preventing highly skilled firefighters efforts to tame the inferno. The fire – which comprises two blazes in the state’s north – was declared the biggest in California’s history on Monday. This tweet shows the magnitude of the fire which can be seen form hundreds of miles away. In order to cope and try to control the fire, fire crews have been boosted by US army personnel and more than 1,000 prisoners. The prisoners have been sent to the front line to help firefighters tackle the fires. In the United states prisoners are considered low-risk and they work on a volunteer basis but they also receive some compensation which is controlled and managed by the Prison warden. Additionally, fire crews from Australia and New Zealand have also flown in to share their expertise in battling bush fires. However, officials said a spark created from a wheel hitting the asphalt, because of a flat tyre could be what ignited this catastrophic blaze. The dry and hot weather allowed the Mendocino Complex fire to make extraordinary gains, jumping across at least four creeks and one major road. A protective fire line – where bulldozers had cut through vegetation to create a barrier – also failed to hold it back. So far 11 people have reportedly died from the fire and many thousands are being evacuated. Speaking from his New Jersey golf course, President Donald Trump paid tribute to firefighters and emergency crews. “It’s been a very tough situation taking place in California for a number of years. And we’re going to have some meetings about it, because there are reasons and there are things you can do to mitigate what’s happening. “We’re deeply grateful to our incredible firefighters and first responders. They’re really brave people,” he said. He also sent a tweet – aimed at a political foe as he couldn’t resist the opportunity to score political points at a time of national crisis. According to Californian officials and wildfire experts Trump’s claims are false.